The Great Depression was a severe worldwide economic depression in the decade preceding World War II. The timing of the Great Depression varied across nations, but in most countries it started in 1930 and lasted until the late 1930s or middle 1940s. It was the longest, deepest, and most widespread depression of the 20th century. 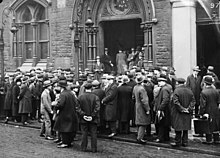 The Great Depression, like most other periods of severe unemployment, was produced by government mismanagement rather than by any inherent instability of the private economy. - Milton Friedman. The Great Depression deserves its title. The economic crisis that began in 1929 soon engulfed virtually every manufacturing country and all food and raw materials producers. The singer-songwriter has always played music that was stylistically rooted in the '30s and the Great Depression and the Dust Bowl. But the fact of the matter is that none of us remember the Depression firsthand. The average man won't really do a day's work unless he is caught and cannot get out of it. There is plenty of work to do if people would do it. Henry Ford as quoted in The Zanesville Sunday Times-Signal [Zanesville, Ohio] (15 March 1931): On reasons for the Great Depression. John Kenneth Galbraith, Money: Whence It Came, Where It Went (1975) Chapter XIV, When The Money Stopped, p. 183-184. Historians have since learned that FDR's vaunted New Deal, with its massive new government programs and antibusiness regulations, had done nothing to end the Great Depression. After six years of FDR, unemployment in 1939 still stood above 17%. In the large sense the primary cause of the Great Depression was the war of 1914-1918. Without the war there would have been no depression of such dimensions. There might have been a normal cyclical recession; but, with the usual timing, even that readjustment probably would not have taken place at that particular period, nor would it have been a "Great Depression." Herbert Hoover, The Memoirs of Herbert Hoover: The Great Depression, 1929-1941 (1952) p. 2: Lead paragraph Chapter 1 : The origins of the Depression. This is a nightmare, which will pass away with the morning. For the resources of nature and men's devices are just as fertile and productive as they were. The rate of our progress towards solving the material problems of life is not less rapid. We are as capable as before of affording for everyone a high standard of life … and will soon learn to afford a standard higher still. We were not previously deceived. But to-day we have involved ourselves in a colossal muddle, having blundered in the control of a delicate machine, the working of which we do not understand. The result is that our possibilities of wealth may run to waste for a time — perhaps for a long time. John Maynard Keynes (1930), "The Great Slump of 1930" , in Essays in Persuasion; Referring to economics and the Great Depression. (5) acting as a lender of last resort by discounting or otherwise providing liquidity in financial crisis. Lawrence Klein, "Lawrence R. Klein - Biographical," 1980. The early thirties brought what liberal economists called the great depression and Marxist economists described as the great crisis of capitalism. It dawned on me that the economic world order was unreliable, unstable, and, most of all, iniquitous. I sought intellectual contacts and friendship with a group of socialist students and also with a small handful of communist-oriented students and unemployed workers. Tjalling Koopmans "Tjalling C. Koopmans - Biographical". Nobelprize.org. Nobel Media AB 2013. Web. 9 Jun 2014. World War II ended the Great Depression with one of the great public-private industrial collaborations in the history of man. - Jon Meacham. World War II ended the Great Depression with one of the great public-private industrial collaborations in the history of man. I think what happened during the Great Depression was that African Americans understood that Republicans championed citizenship and voting rights but they became impatient for economic emancipation. The minimum wage is something that F.D.R. put in place a long time ago during the Great Depression. I don't think it worked then. It didn't solve any problems then and it hasn't solved any problems in 50 years. Dennis Holme Robertson in "How Do We Want Gold to Behave?." The International Gold Problem, Humphrey Milford (1932): As cited in imagi-natives.com; Also cited in: Murray N. Rothbard (2013) America's Great Depression (LFB) p. 1921. Karl Rove, Remarks of Illinois State Sen. Barack Obama Against Going to War with Iraq (2 October 2002); referencing the positions of former Pentagon policy adviser Richard Perle, Deputy Defense Secretary Paul Wolfowitz, and chief Bush political adviser Karl Rove. Oh yes, and it was also valuable that the Chicago I went to was the best place in the world at that time in neoclassical economics. But that does not mean it was the best place in the world to understand the Great Depression. The Great Depression was not Euclidian geometry. I was very sensitive to this mismatch, that is to the fact that what I was learning in class could not rationalize for me that almost every bank in my neighborhoods in Northern Indiana and Illinois went broke and that almost all the money that my older brother had earned to go to college was lost. In a nutshell, about one third of the population had no jobs. And the two thirds who had jobs would not trade with them. The one third without jobs would gladly trade with them or gladly work for even less. But of course they couldn’t do that. To try and handle this kind of disequilibrium system with the historic tools of economics that were in the textbooks I was being assigned was impossible. So you can understand why, then, by complete good luck, I happily got out of Chicago. From 1931 to 1935, I was an undergraduate at Cambridge in my father's old college, Gonville and Caius, which was particularly strong in medicine and the law. However, after two years of law I switched to economics, much to my father's disappointment. At that time the world was in the depth of the great depression and my motive for wanting to change subject was the belief, bred of youthful ignorance and optimism, that if only economics were better understood, the world would be a better place. Richard Stone (1984), "Richard Stone - Biographical". Nobelprize.org. Nobel Media AB 2013. Web. 14 Jun 2014. Wall Street has come a long way from the insider-dominated world that was blown apart by the Great Depression. This page was last edited on 23 March 2018, at 16:59.